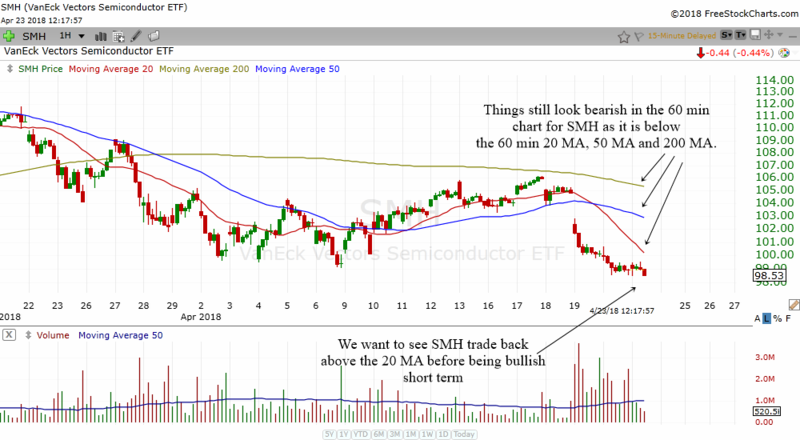 In this article we will have a look at how the important semiconductor sector is performing using technical analysis. We will look at important technical developments in the stock's price using technical analysis. Well, SMH has broken out of the box that I have drawn in my previous analysis. It kind of drifted sideways but eventually it formed an even better pattern. That pattern is the 60 min ascending triangle which you can see below. SMH has broken out of the ascending triangle and the top of this chart pattern will now be a new area of support. I believe that as long as SMH stays above the top of this chart pattern then it will continue to rise. This will also be good for the semi sector and because semis tend to lead the market, it will be good for the stock market overall. The SMH is still above its rising 60 min 20 MA and 50 MA. Therefore we should continue to be bullish on the semi sector. Well taking a look at the 60 min chart of the SMH above, we know that SMH has gone up quite a lot since it broke a downtrend line. It is now in a 60 min uptrend but I guess it will not be a smooth ride up because of the massive amount of resistance in the daily chart. Support area is around 104.50 area and I believe if SMH stays above this then the semis will continue to move up. Most semi stocks will move up. 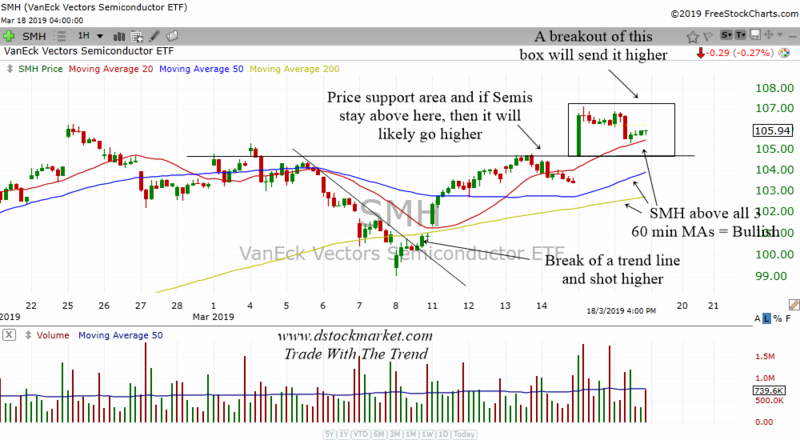 I have drawn a new box in the 60 min chart for SMH and a break above this box will help to send SMH higher while a break below it will send it lower. In order to learn more about the semiconductor sector we shall have a look at the SMH. 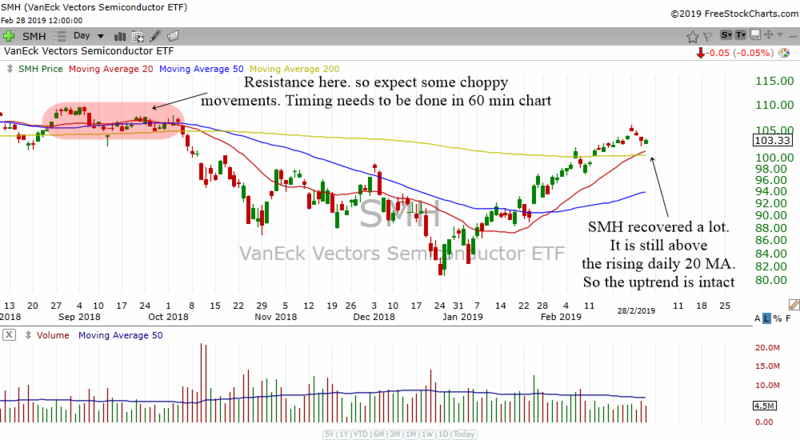 SMH is the VanEck Vectors Semiconductor ETF and they are quite an accurate reflection of how the semiconductor is performing. At this moment, the SMH is about to meet the rising 200 day moving average. This moving average is very important as the SMH has not fallen below the 200 MA for a very very long time. The 200 MA is a gauge of the long term health of the semiconductor etf. There is also price support below which I have highlighted in green. The $96 area will be an important area for semi stocks. 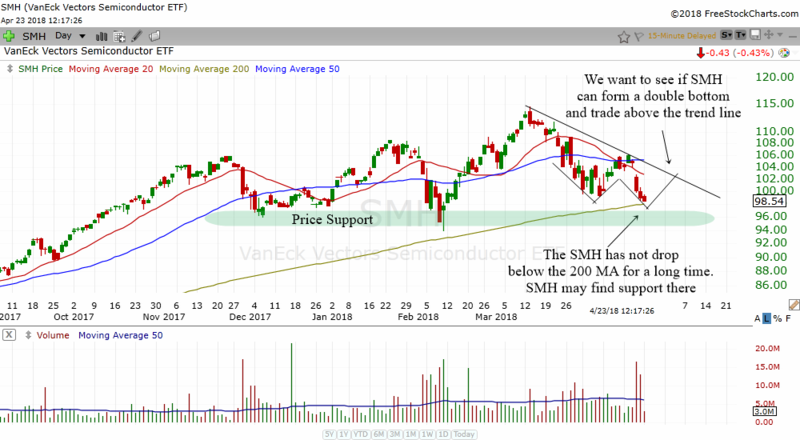 If SMH falls below the 200 MA and slashes through the price support area then we can expect more weakness in the semiconductor sector and perhaps the start of a bear market in semi stocks. The SMH may be on the verge of forming a double bottom in the daily chart. 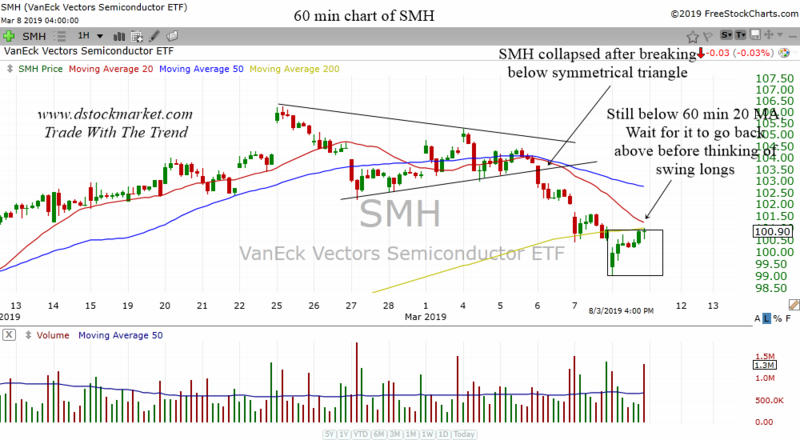 If it can find support at the rising 200 MA, then it might be possible for SMH to form a double bottom. 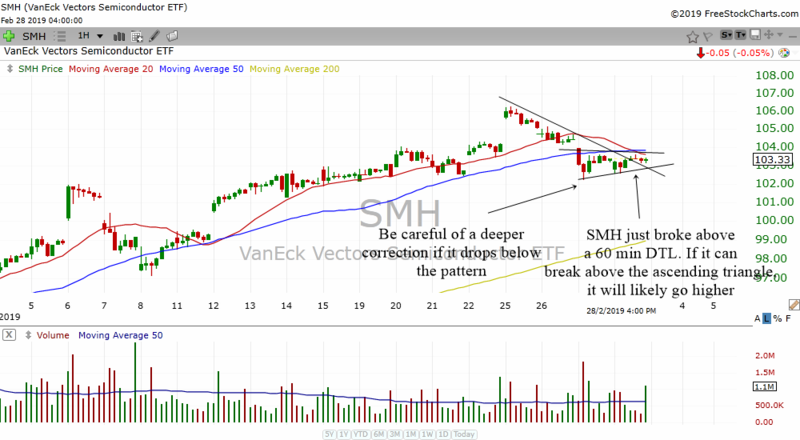 We want to see SMH form the pattern and also break back above the downtrend line. That will be a good case for the bulls. The 60 min chart at the moment is not very healthy. I believe the negative news regarding Apple's Iphone X sales is having a negative impact on the entire semi sector. Which is why the SMH gap down last week and started the sell off. Currently the technicals for SMH in the 60 min chart is also not very good. Price is below the 60 min 20 MA, 50 MA and 200 MA. When the price is below all 3 moving averages, this is not a very healthy picture for the SMH in the short term. 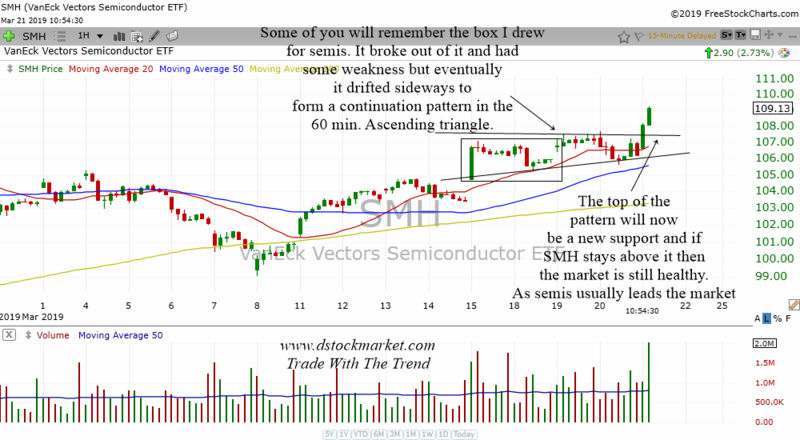 We want to see SMH break back above the 60 min 20 MA before being bullish again on semi stocks in the short term. Let's take a look at the weekly chart of SMH for a long term picture of the semiconductor sector. 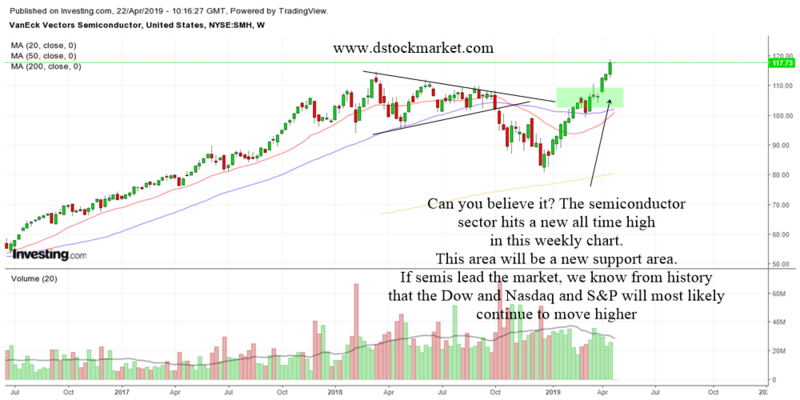 The weekly chart above shows that the SMH is in a very powerful long term bullish uptrend. 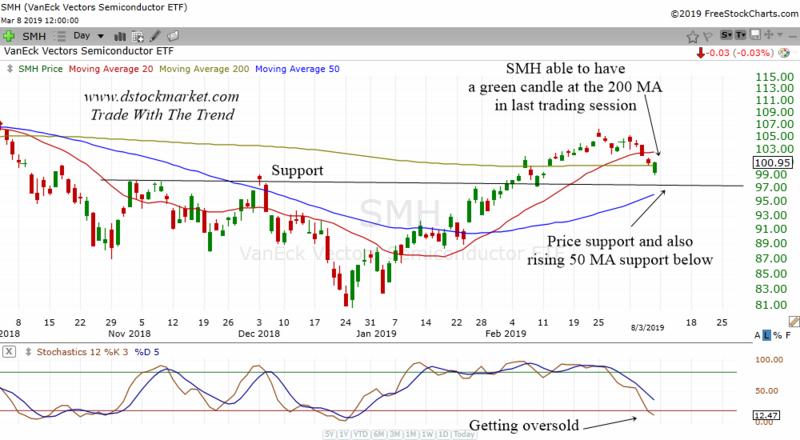 SMH has been staying above the rising weekly 20 MA, 50 MA and 200 MA most of the time and it is only recently that SMH has dropped back down below the weekly 20 MA. It is still trading above the rising weekly 50 MA. 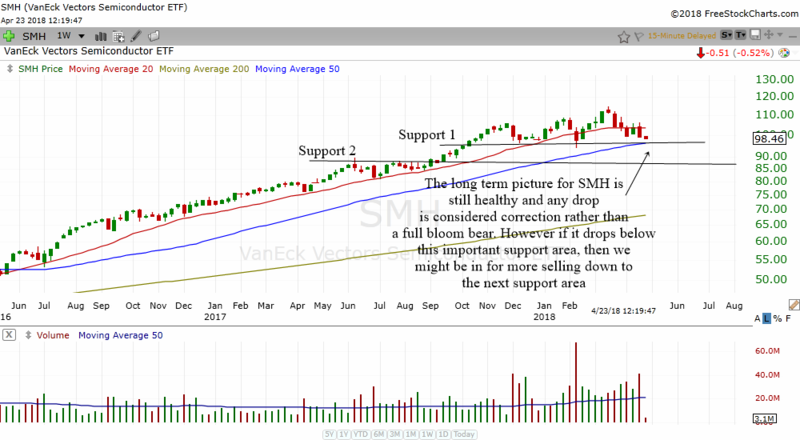 SMH is also trading above the important support 1 that I have annotated on the weekly chart. I believe that as long as SMH can stay above support 1 and also the weekly 50 MA, we are still in a healthy long term bullish uptrend. However if the SMH drops below these 2 important areas then we can expect more selling down to support 2. This will no doubt drag down many semi stocks as well as the entire stock market.